Our visitors are going to have the chance to snag one of three annual membership subscriptions through the fantastic PixelKit. That certainly gives you a great opportunity you won’t want to miss! The three entrants who are lucky enough to win will receive a subscription for an annual membership account through PixelKit.com. The winners will have free access to thousands of graphics available through PixelKit. This site offers 100% specialized UI kits perfect for any web designer. If you win, then you will have access to navigation controls, app screens, and much more. You can choose from a variety of carefully designed icons, buttons, sliders, and many different elements for everything you could possibly need. How do you enter? It’s quite simple. Follow the steps in this widget. To really appreciate why this is such an opportunity, just think of a few things: you get high-quality UI kits at your fingertips right away. You can save time and energy since you don’t have to spend time hunting or designing. By saving so much time, you will be able to move on to more projects much more quickly. This dark UI kit is clean and elegant. It is perfect for a modern, corporate site that needs a professional image. This vector icon set is a very modern option that will work perfectly for metro style apps and websites. This stats infographic kit will allow you to present all of your complex information easily. Perfect for data and other statistics websites. Perfect for coffee shops, bakeries, bistros, and pastry shops, this clean UI kit is light, airy and easy to enjoy. This flat icon set is colorful and fun, ideal for a website or app. These modern, flat icons are ideal for a metro style website that needs a new feel. This UI kit has a fresh, fun, and playful layout. The kit includes more than 100 different vector elements so that you have everything you need for a cohesive site. 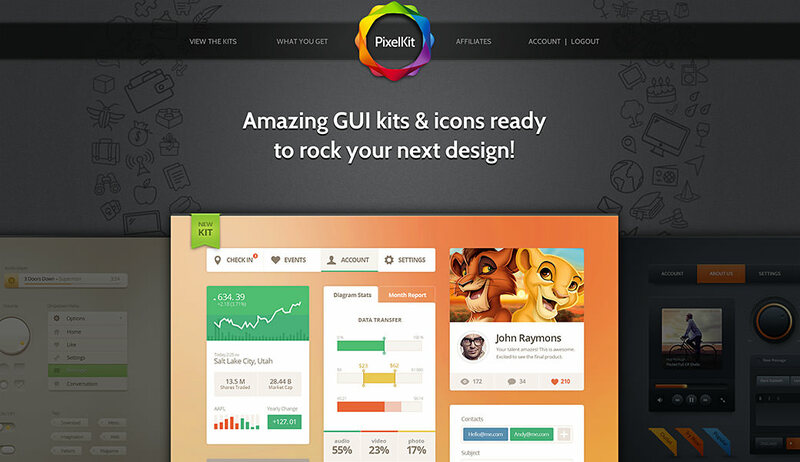 Check out this special treat– the Free PixelKit Bootstrap UI Kit. You can download this modern HTML template and use it to make your design even more functional and cool looking.